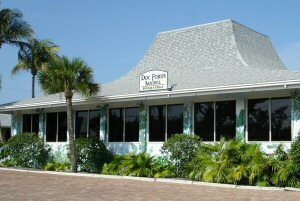 Doc Ford’s Sanibel Rum Bar & Grille is a unique place; a casual, family-friendly restaurant with a sports bar that also serves gourmet food. If that isn’t enough, its also a place for book signings, entertainment, meeting sports heroes, fishing guides and working writers. The spirit of this fine establishment was inspired by local best-selling author Randy Wayne White’s main character in over a dozen books – Marion “Doc” Ford, a marine biologist and ex-government agent who yearns for the quiet, contemplative life of a scientist….but that’s just not to be…. At Doc Ford’s, we take pride in our food and it shows! Everything is made daily using only the freshest produce, meats and fish. In addition to our great menu, we offer a variety of daily specials. Stop in and see what Chef has cooked up today! One visit will bring you back again and again.